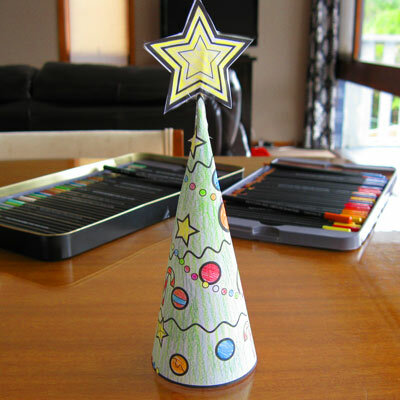 Christmas tree craft – and prizes! Is your tree up yet? We’re doing a fresh tree again this year, so I’m not buying it for another week. The kids are pestering me though (not being brats, just super-excited), so I’ve done up this little bit of Christmas tree craft to tide them over. It’s really simple. Just download the PDF, print, colour and tape or glue up. Wrap the star over a toothpick and pop it in the top of the cone. It might make a cute addition to your Christmas table, or you could make little ones and stick name labels on for fun little place-tags. Whatever you do, make sure you snap a pic of it and upload it on Facebook or email me at vegiesmugglers@gmail.com and you could win a Vegie Smugglers prize pack, with both books, postage & all the e-books. Entries close December 10. ***I”M RUNNING THIS COMP AGAIN FOR 2013 – YOU’VE GOT UNTIL 8PM AEDT, DEC 20 TO UPLOAD YOUR ENTRIES! *** CONGRATULATIONS TO LEANNE QUINN! GORGEOUS FAMILY PIC, LEANNE! 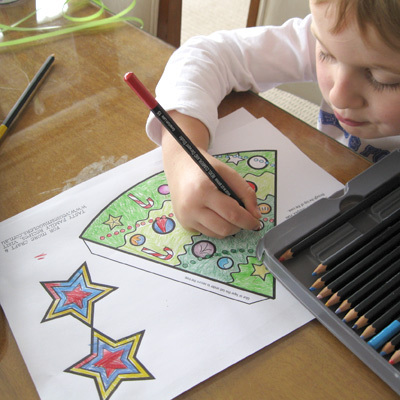 Or if you can’t be bothered, just use the project to keep the kids busy for half an hour while you start your list for the (Christmas) Final Countdown. Bless. Mr Meat & Potatoes works on his competition entry. Thats lovely!! Ive printed 6 as I think the kids are not going to want to stop at one!! Thanks!! Just did these this afternoon, the kids loved them! Thanks for the idea. lol – I love how you’e tagged it under craft for non crafty parents – thats soooo me! my girl will love doing this – thanks! Am going to get some printed for the kids and nieces/nephews though to give them something crafty to do on Christmas Day.